Welcome to another installment of FIRESTORM FAN’s Nuclear News! Here are some news and web findings on our favorite hothead. The biggest Firestorm news is that Brightest Day #0 ships today! Be sure to stop by your local comic book store and pick up yours. Hopefully Firestorm will play a role in the issue. If you are looking for some lively discussion on our favorite nuclear man, head over to the DC Comics Message Board Firestorm forum. There is always some good Firestorm talk going on over there. Behind the Voice Actors – Check out this fun side-by-side comparison of the voice-over actors who have played Firestorm with sound clips and images. Listen to each clip, then vote for your favorite in poll on the right-hand side. For me, Mark Taylor will always be the voice of Firestorm. Super Friends was my first exposure to the character, so that portrayal holds a special place in my heart. When you’re done with that, check out the Behind the Voice Actors for Killer Frost! 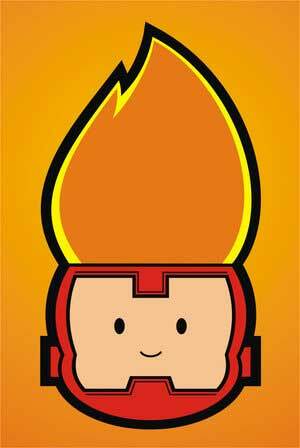 Click here for an interesting list of folks with flaming hair on the TV Tropes website. Includes characters from comics, literature, movies, video games, and more. 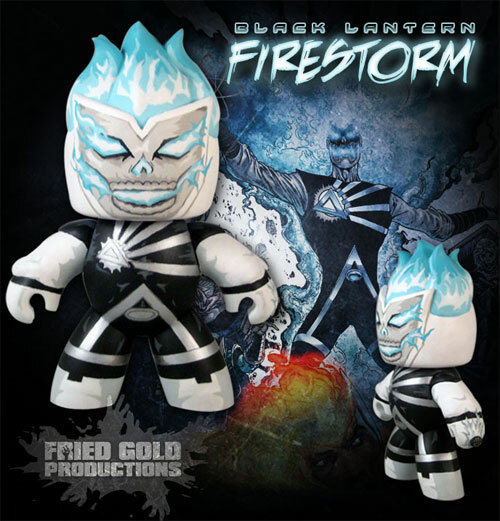 Below is another custom Mugg of the Black Lantern Firestorm. Really great job on this custom! You can view the whole set of Blackest Night Muggs over at Fried Gold Productions. If you are looking for more classic Firestorm action and back issues aren’t satisfying your craving, you could always try some fan fiction. The Faux DC site features a series of prose adventures starring Firestorm V (Ronnie Raymond while he was solo prior to his death in Identity Crisis). There are 12 issues of the fan fiction Firestorm available. Also, the Justice League of America series features Firehawk. 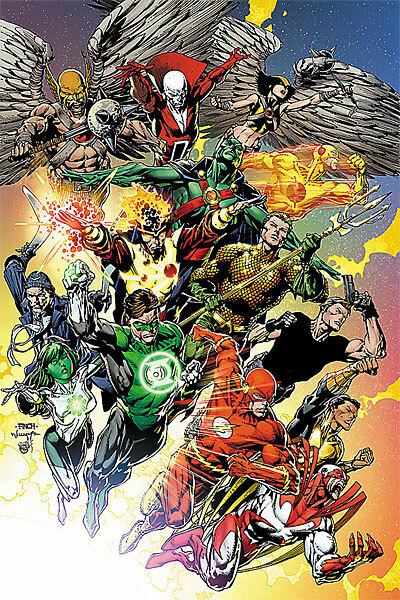 Click here to check out the Firestorm issues and click here to check out the Justice League of America stories. 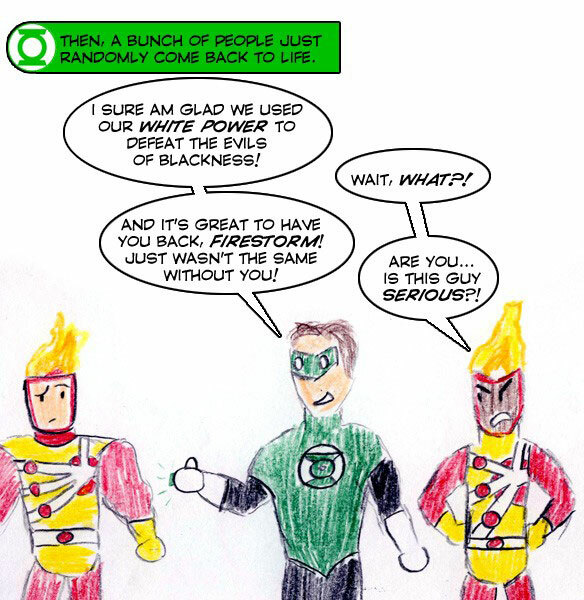 Over at Comics Alliance there is a hilarious parody entited Blackest Night in 60 seconds. Below is the panel relevant to Firestorm. My thanks to the Girls-Gone-Geek for sending this my way. 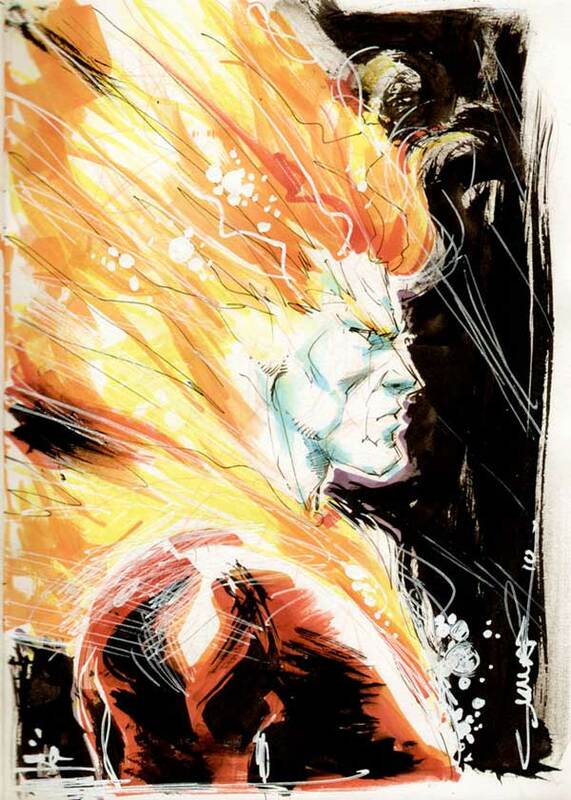 Below is a fantastic sketch of the Elemental Firestorm done by Yildiray Cinar (artist of the Ravager co-feature in Teen Titans and the upcoming Legion of Super-heroes series). I really like his take on the Elemental Firestorm! It’s just gorgeous! Click here or the image to visit Cinar’s website. If you’d like to see the previous sketch, click here. 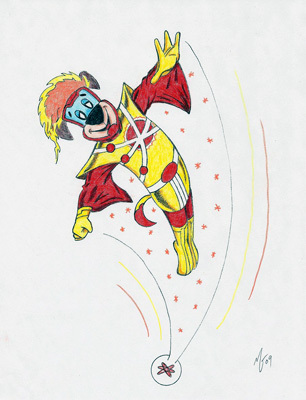 Below is a cute sketch of Huckleberry Hound as Firestorm by ~zombiegoon on Deviant Art. Below is another cute sketch of Firestorm, this time by *jbrant047 on Deviant Art. These next few are fan reimaginings from the Superbuddies.net forum. This first one is by cattjay12345 and represents their vision of Firestorm from the Ultimate universe. The next one is by Jor-El and is essentially a fancy version of Firestorm’s contemporary costume. Here’s how Ronnie Raymond might look on the Smallville TV show, again by Jor-El. 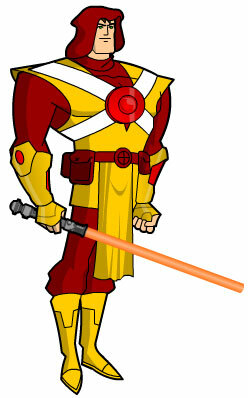 And now, just for fun, the Jedi version of Firestorm, also by Jor-El! 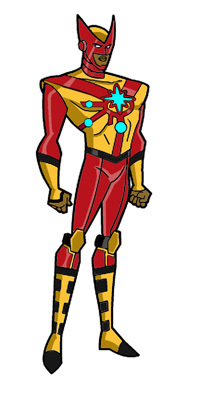 Watch this space for more information on Firestorm in Brightest Day! Posted in: Blackest Night, Brightest Day, Cartoons, Comic books, Firehawk, Firestorm #03: Elemental I (Ron/Mikhail/clone), Firestorm #05: Ron solo, Firestorm #08: Brightest Day (Ronnie/Jason), Jason Rusch, Justice League of America, Killer Frost, News, Ronnie Raymond, Sketch/Art, Yildiray Cinar.